Enhance democratization and citizen empowerment. Confidence Building: Those measures that help the citizens develop confidence in the e-governance and encourage them to take to the e-transformation. The infrastructure issues, which are important, are poor rural telecommunications network, power problems in various parts of the country and network connectivity. Unless these three areas are improved an effective Internet governance program cannot be implemented. 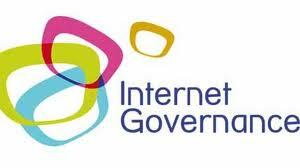 Internet governance implementation leads to information sharing at each small unit level in the masses, high awareness and transparency in governmental functioning. This also needs a strong back end functional support to successfully maintain the Internet governance initiative; in the absence of which the system will collapse. Due to corruption deep routed in the political and administrative system, majority of the people at the authoritative positions in the respective functional departments may dislike the transparent and smooth working after Internet governance initiative. Such cultural habits are difficult to fight with which is an essential prerequisite of the Internet governance. Resistance of Staff is also a very likely aspect, which needs to be taken care of by taking steps in advance and by spending goodwill among the employees. On the other hand, people always fear to experiment new things, newer means of functioning. In the initial stages, any Internet governance project is likely to face criticism and set backs because of lesser public participation. Further owing to lower literacy rate in any country, the reach of the project remains restricted to the literate people in the society. To catalyze the tremendous social returns that are possible, the sheer magnitude of available capital must increase exponentially and the capital must be invested strategically. Poor requirement-gathering (particularly in the case of frequent policy changes) and non-involvement of end-users during this process, poor or negligible IT awareness among decision-makers, poor management of knowledge and human resources, non-compatibility between IT projects and business processes, poor risk management, choice of technology and over-ambitious projects are among the root causes of problems in achieving significant Internet governance benefits. Poor over all literacy rate and language barriers are other issues, which limit the usage of such projects. Authenticity of the information sent across the web. The use of digital signatures is therefore much more required in case of Government documents. Confidentiality of any transaction or information available on the network is a very crucial matter and is there fore of vital importance to the successful Internet governance implementation. Protecting the information and important governmental documents from unauthorized users is all the more important in Internet governance. Cryptography is an important process to protect the information from unauthorized users and is an inseparable part of network security. Tested encryption software is installed before initiating the Internet -governance. Maintaining and assuring Integrity of the information is also an important aspect of digital security, which becomes all the more important in Internet governance. In the absence of encryption and digital signatures, information integrity cannot be guaranteed and this may lead to new forms of fraud, as digital documents are the easiest to forge. Continuous availability of information 24 hours a day is important for efficient and effective functioning of the Internet governance system. This is in fact, a key distinguishing feature of the Internet governance system. Therefore any anticipated hardware problems, network errors, link failures etc. need to be safeguarded before hand. Network Security by using multilevel barriers is in place for effective protection of the networks. These may use password schemes, biometrics, SMART card authentication and firewalls. This offer is to be supplemented by incubating and initiating efforts in this direction by various organs of the Govt. Amendment in State laws through study and consultation. Organizational and institutional changes affecting both people and methods at all interfaces of the delivery chain. For this, acceptance of this Changed Processes would have to be properly understood, accepted, internalized, adopted and improved to enable full advantages of the technology being adopted in the first part of Smart Governance. De-layering of the decision making levels leading to re-engineering and appropriate sizing of the decision making machinery. Training and acclimatization of the personnel at all levels more so at the lower rung of Government management organizations. Loss of vested interests and assumed power as well as authority both amongst the legislature and the executive. Apart from the ambitious work plans, the financial issues related to Internet governance have to be weighed in terms of available resources both in the Plan sector and out side it. It is here that leveraging of on going projects can be made more cost and value effective with the use of IT in a modulated fashion without any critical incremental costs. The Private sector resources have to be also carefully dovetailed with their commercial interests and those of the Government to provide value added services. The Kiosks by themselves can bring in little in terms of better delivery of services, unless the same are made economically viable and of demonstrated use to the stakeholders, viz. the public and the citizenry. Higher cost for high-end applications is another attention area. (1) The blue book is for the policy makers. 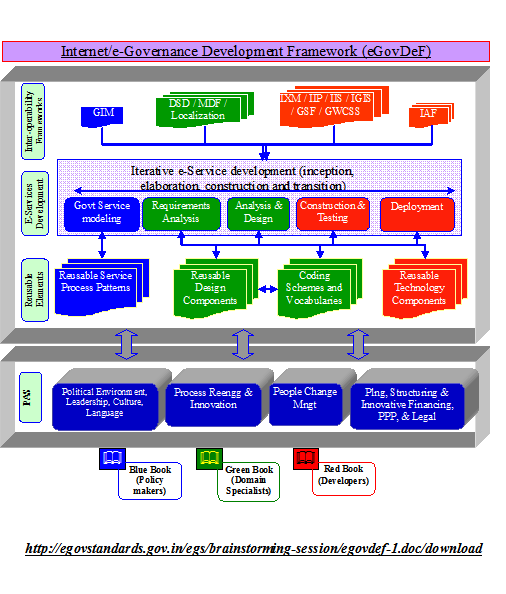 It covers the Internet Governance Development Framework incorporating PAS (Project Assessment of Sustainability), reusability of processes, patterns, designs and components, e-services development shaped by a set of standards, and an abstraction of the information elements in any Internet Government Service through the Generic Information Model (GIM); It also recommends the modeling elements of the Government Services and the reusable service processes and patterns. This looks at certain common processes across all Internet Governance projects such as e-filing, e-Payment, e-Returns etc. The GIM provides a consistent framework for requirements capture. (2) The red book is for the Developer community. Through the Information Exchange Model (IXM) and the Information Accessibility Framework (IAF) it provides the nitty-gritty for incorporating the standard components in the design artifacts. Further, the Interoperability Interface Protocols (IIP) and the related Interoperability Interface Specifications (IIS) provide the necessary interface protocols and specifications for connecting to the services via the Government Gateway. The Security policies are expected to guide the policy makers and the developers in plugging in the required levels of security in various components of the architecture, which are covered in the Government Security Framework (GSF). The Red book also addresses protocols relating to Inter-Gateway communication in the Inter-Gateway Interconnect Specifications (IGIS). The Government Gateway as a critical interoperability mechanism also provides the specifications for interfaces to certain common services such as Payment Gateway, authentication, Services Directory, Joined up Services, the National Services Directory and other third party Service Providers. These are addressed in the Gateway Common Services Specification (GWCSS). (3) The green book is for the domain experts. Standards relating to data are covered here. Data Standards Definition (DSD) standardizes on commonly accepted data definitions for various elements of data used in the Government Service; the Metadata Framework (MDF) helps in easy search and retrieval, by incorporating commonly accepted attributes in various documents of the Government. The result of this work would be the e-Thesaurus and Information Source Atlas (ISA). A critical component identified in improving the functioning of the Government and to harness the information wealth of the Government towards improving the effectiveness of governance is the National Internet Governance Services Delivery Gateway (NSDG). The National Gateway aims to achieve a high order of interoperability among autonomous and heterogeneous entities of the Government (in the Centre, States or Local Governments) in an asynchronous manner, based on a framework of Internet Governance Standards. NSDG as a messaging middleware achieves integration amongst diverse set of applications built on varying platforms through compliance with a set of Internet Governance Standards that enable consistent communication [Interoperability Interface Protocol and Specifications (IIP/S)] and conformance to international standards that evolved concurrently with the evolution of the Internet as a major enabling platform, such as the XML specifications and SOAP. The messaging infrastructure takes full advantage of the Extended Markup Language (XML) and the SOAP specifications to achieve the desired intercommunication capability. This middleware routes service requests from a Service Seeker to a Service Provider (typically a back end department that puts up its service for electronic delivery) and in return sends the response back to the Service Seeker through the Gateway, all in an asynchronous manner. Service Providers (SP) would be the back end Government Departments or any other third party Service Provider offering specialized services such as authentication or payment Gateway services or the Joined up Services. Collectively referred to as “Service Provider (SP)”, the SP would provide specific services to citizens and businesses and to other Government Departments seeking specific services from other Government departments or any third party service providers. The Gateway may link up to the Joined up services which is the aggregation / de-aggregation mechanism of multiple services from the back end departments to be offered as a single service to the service seeker. The Joined up Service will be set up as a separate service freeing the Gateway of its primary responsibility in the management of joined up services. Many such Joined up services from certain verticals is a distinct possibility. Service Access Providers (SAP) enables the citizen to access Government services and information electronically and to develop a personal profile with respect to their dealings with Government. It will facilitate the organization of public services around the needs of the citizen and will promote seamless service delivery. It will also realize the concept of joined up Government by enabling the citizen to have a one-point interaction with the Government services electronically. Linked to the Service Access Providers (SAP) will be the Delivery Channels, which would be the ultimate front-end access mechanism for the citizens and businesses for the electronic delivery of services. Services will be accessible from virtually any device. Such delivery channels could include Mobile Phones, Personal Digital Assistants (PDA), CallCenters, Information Kiosks, Personal Computers including notebook computers, or any other new devices providing easy access to the end user. This would also include temporary delivery channels set up by the department themselves or through any third party arrangement to meet additional workload during peak seasons to cater to public demand. Other Gateways – The future Internet Governance space would see many Government Departments offering many services, which will be consumed by the Citizens, Businesses and other Government Departments. All of these services may be distributed among more than one gateway in the Centre, States not excluding Gateways in specialized verticals (Gateway Constellation), which, in turn, may reside under different administrative domains. A Gateway becomes meaningful when there are multiple services offered, each operating on different technology platforms, when multiple units or sections within the Government Department needs to be integrated. 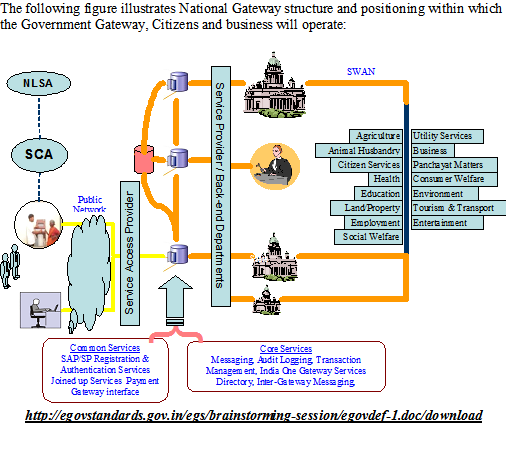 However, in order to achieve a “simplified” and “unified” face of the Government, it is imperative that all these gateways, under various administrative domains work in close co-operation and in unison to support the “outcome based” service delivery to the Citizens, Businesses or Government Departments. To achieve this, it is necessary that all the gateways under various administrative domains have the ability to communicate with each other and transfer relevant information as and when required.